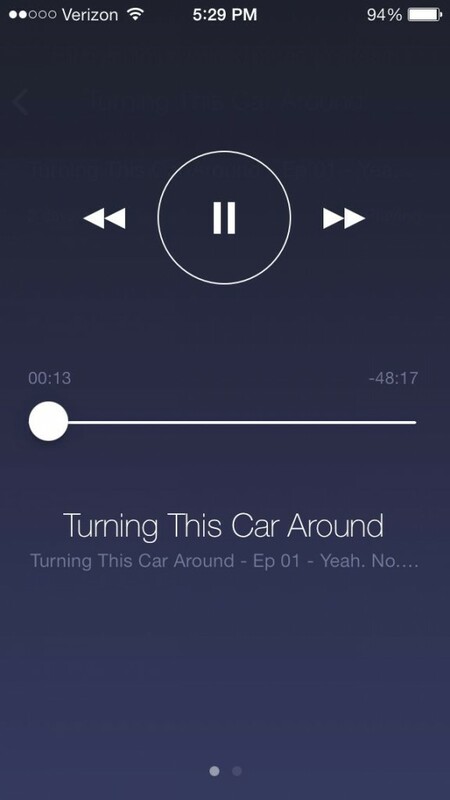 Back in December I posted a mini-review of Castro, a nicely iOS 7-ified podcasting app. Since then I’ve been introduced to Network, which is another really nice iPhone app. Network takes a different, more visually minimalist approach than Castro but one that’s still very iOS 7-y (I am a professional writer) and quite appealing. If you don’t like transparency, you’ll probably like Network, because there isn’t any. The main list of podcasts is a simple icon grid with a plus icon for adding more. Network has nice transitions — bouncy-bouncy, slidey-widey — and making note of them is key. Tapping on a show slides in the episodes from the right, which means you swipe right to go back to the list of shows. 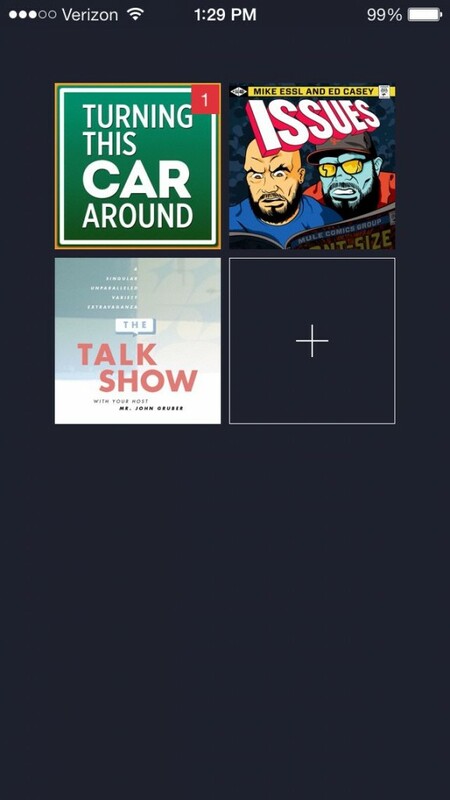 Tapping on an episode slides the player up from the bottom, which means you swipe down to go back to the list of episodes. You can swipe left in the player to see the episode summary as the two little page dots at the bottom of the screen indicate. Once you start an episode, a little player icon will stay on the bottom of the screen along with the show name, so you can always get back to what’s playing. In the episode view, swipe left to delete an episode and I hope you mean that because it won’t ask you if you do. Once the dot clears, it’ll get deleted if you release. Throughout the app, Network’s interface is clean, pleasant and consistent. I’m sure some people won’t like the blue text on a blue background that Network uses for titles, but I’m not one of them, even though my reading eyesight isn’t what it used to be. One missing feature I found: I wasn’t able to add a podcast with a URL. Other than that, it did everything I wanted. Network is $2.99 on the App Store and I think it’s another really nice entrant into this category that’s exploding with the red-hot fury of a million $2.99 suns. Once again, disclosure: I got my copy for free and, again, they feature an episode of The Talk Show I was on in their screen shots on the App Store. Although, it’s shown being deleted so I’m not sure that really counts.